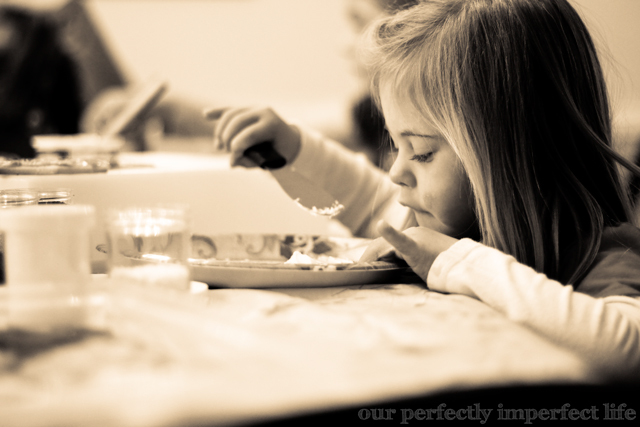 our perfectly imperfect life: These are the moments I crave. When I was growing up, we lived in snow-clad areas of the country... New York, Pennsylvania, Michigan, Wisconsin. We never questioned whether or not we would have the white fluffy stuff that winter. Not to mention the fact that we probably wished it away too. Sledding, snowballs and snowmen... we took it all for granted. And I went to college in Minnesota, where although we always had snow... classes weren't canceled unless the wind chill was like 80 below and you literally could not breathe. And today... somehow I ended up living in a state that might get snow. 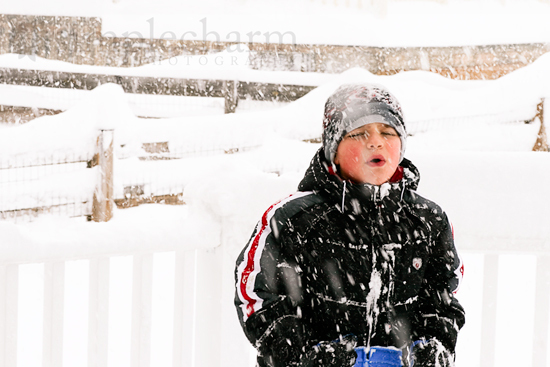 It messes with your mind, not knowing whether we will even get the chance to sled or make a snowman with the kids. We have gone from getting barely anything one year to getting 31 inches another year. But there is never a guarantee. I am a little depressed seeing all the snow in other parts of the country this morning. Our forecast for Christmas day this year? Sunny and 50 degrees. Pff. 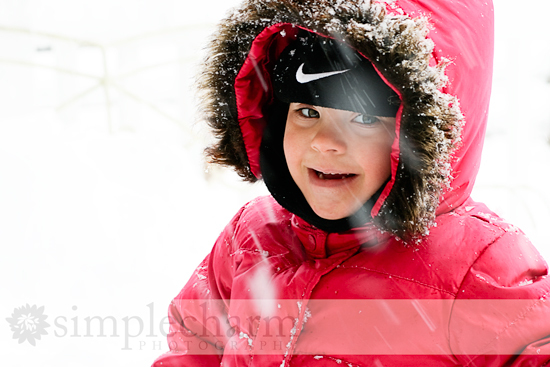 Some of my favorite memories from my childhood involved snow... and I want that for my babies. Please Mother Nature... deliver! 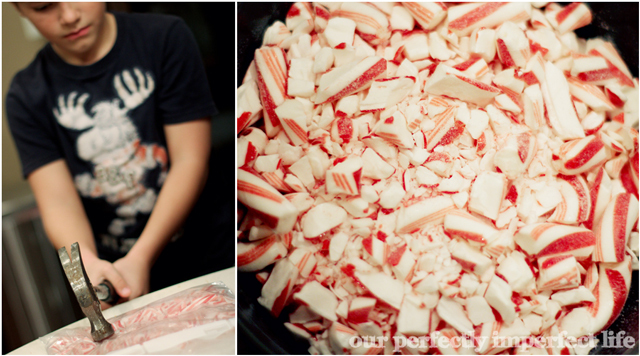 1) Smash up some candy canes. 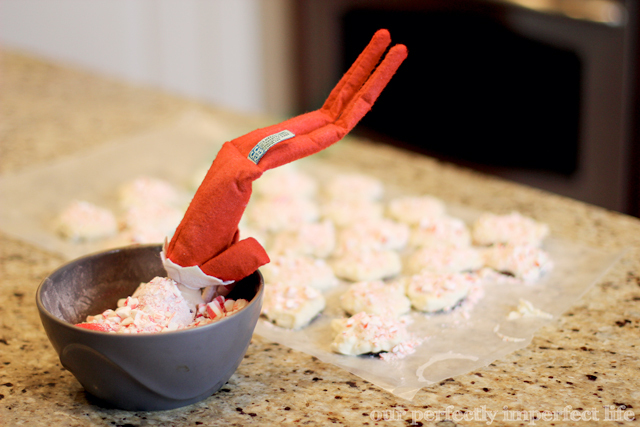 2) Spread the Grasshopper cookies out on wax paper. 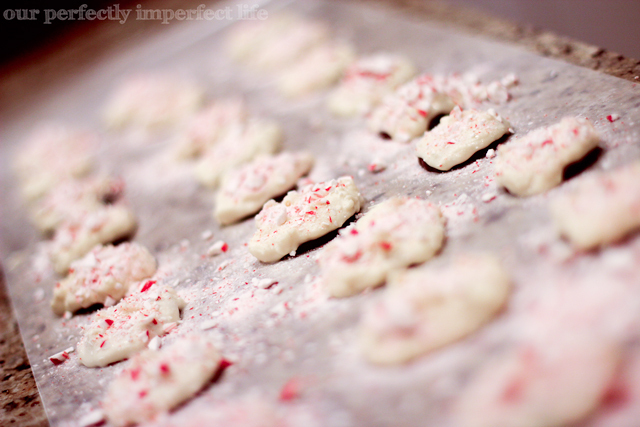 4) Coat each cookie in white chocolate. I hope you are better at melting chocolate than I am. 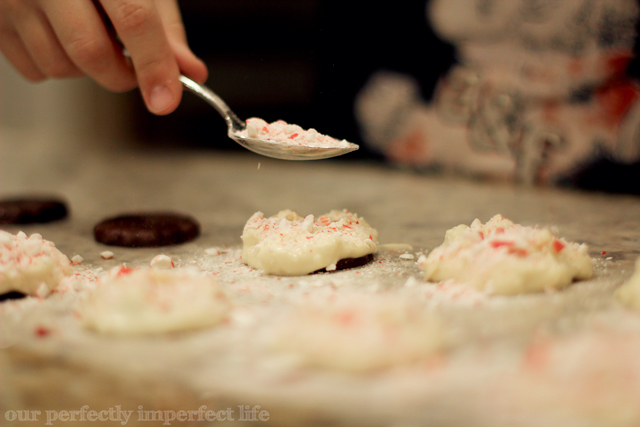 5) Sprinkle crushed candy cane onto each cookie. I forgot to take a picture, but we packaged the cookies up nicely and attached a picture of the kids decorating the cookies. To: Grandpa and Grandma, Love: Mason, Payton and Nika. We had to let the cookies sit overnight so the chocolate could harden. Rex must be starving, because the crazy dude dove head first into our candy that was left over. 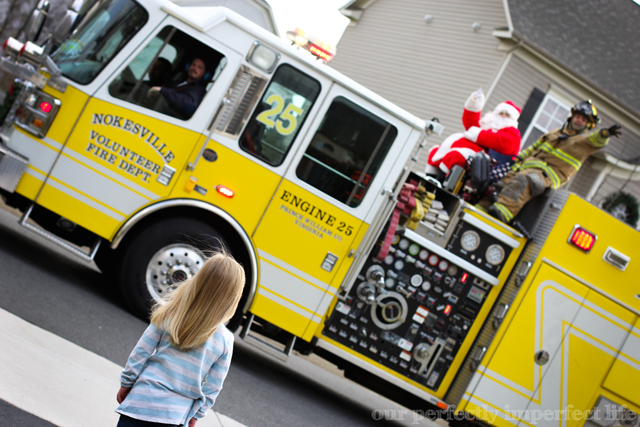 It's tradition for our local fire department to bring Santa around on the firetruck each year. 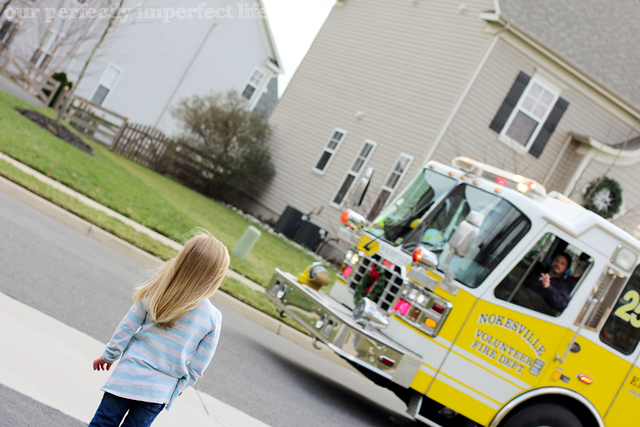 An ambulance leads the pack with sirens blaring, cueing the children to bolt outside to catch a glimpse of the jolly old guy. 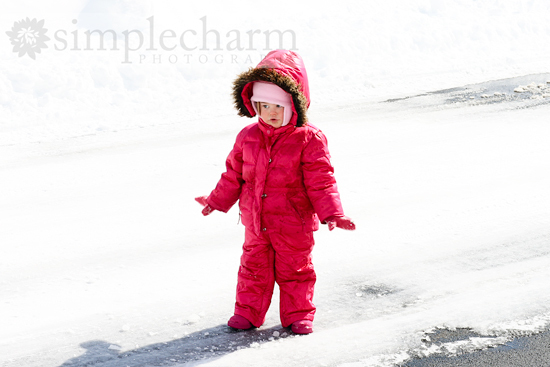 This year it was just Nika and I at home... we ran to the curb and she stood there staring, in awe. There is something about moments like this, when it is just her and I. It allows me to slow down, give her my full attention and feel the moment with her in the spotlight. I stood behind her getting a bit weepy, taking in the enormity of the situation through her eyes. I couldn't help but think about how different her life would be today if she hadn't been adopted by our family... and about how a moment like this would never be happening. These are moments I crave... because I love this kid and I never want to forget our journey. 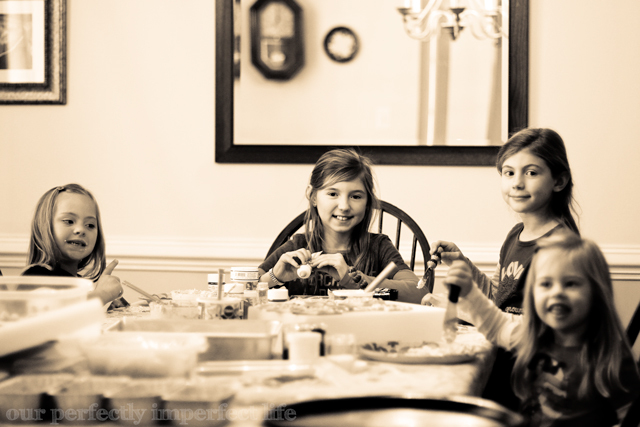 We had our annual cookie baking day this past weekend... grandma, aunts, cousins, grandchildren. We all pack up and gather to bake and decorate cookies. Unless your name is Payton... then you lick a lot more frosting than you smear. 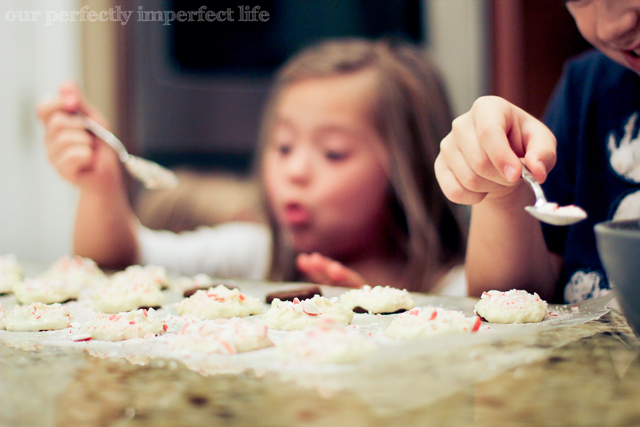 Family cookie baking day is one of the things I most look forward to each holiday season. As we baked, we talked a bit about the closeness of our family... my aunts are like mothers to me... my cousins like sisters. My cousin joked that her friends are always saying, "You are always with your family!" Yup... we tight like that. I can't imagine it any other way... these girls are my soul sisters. And sadly I only have photos of the kids because I accidentally deleted the others... oopsie. Embrace your family. Enjoy the holiday. Do it while you can. Oh my, that calendar looks so much more organized than mine:)I use a regular old calendar that my newspaper sends me every year in January...teeny tiny boxes and all filled up, usually having to write into the next day! Drives hubby crazy...he thinks I am nuts for not using an online calendar. I have little time to get online and figure it all out, i tried using Cozi and failed miserably. And i tried a large dry erase, that didn't work either...paper calendars are easier for me!! Anyway....just wanted to add that Nika sure is a beauty..then and now. Precious! And the elf thing...its all up to me as Rod is out of town every week. I am running out of ideas....YIKES, how many more nights do I need to do this, LOL! I use the busy body planner thanks to your blog post last year and I love it and would be lost without it!!!!! I follow your blog all the time! Nika is so beautiful! So is the others! Ladies... please email me with your mailing address so I can get them in the mail to you... yay! Well I live in Canada, where rumor has it we all live in igloos and travel by dogsled, and we have zero snow as well. While I can certainly do without it, I NEED to have it at Christmas time, but not a single flake will be making an appearance. Better not show up in May! Lacia... I'm sad for you! My friend just went home to South Dakota and said the same thing! I am the same way Bethany about the snow...grew up with it in SD then moved to SC and only get it about once a year...last year it did deliver and we got it on Christmas Day but its not looking so promising this year..I had to come home to SD this week for a few days and there is NO SNOW....i was sooo disappointed!!! Merry Christmas to you and your family!! !